Noah Kaiba (Kaiba Noa) is the biological son of Gozaburo Kaiba and the main antagonist of the Virtual World Arc until his defeat at Yami Yugi‘s hands using both his and Seto Kaiba‘s cards. Noah lived with his power-hungry rich and wealthy father in luxury and was forced to study heavily in the arts and in academic subjects, just like Seto Kaiba later was, but enjoyed it. When Noah was around ten years old, he was hit by a car which rendered his body useless. In the hope of saving his son, Gozaburo Kaiba uploaded Noah’s mind onto a super computer just before Seto was adopted. Noah’s consciousness lived in a virtual world that initially only included his own empty bedroom but was ultimately expanded to include many other areas. While Noah at first found his virtual existence almost pleasant, even enjoyable, the limits and bugs in the virtual citizens and his own virtual pet caused Noah to grow increasingly frustrated, agitated, and in some cases, even sadistic to seek out some satisfaction in his virtual existence. While his intelligence (and ego) grew exponentially, with no real human contact, his maturity remained at the level of a small child. Gozaburo had adopted Seto as a body for Noah, but eventually Gozaburo forgot about his own son, realizing he would always be a spoiled brat, in favor of teaching Seto. When Seto took over Kaiba Corp., Gozaburo (in frustration and defeat) uploaded his own mind into Noah’s virtual world. Six years later, Noah takes his revenge on Seto. 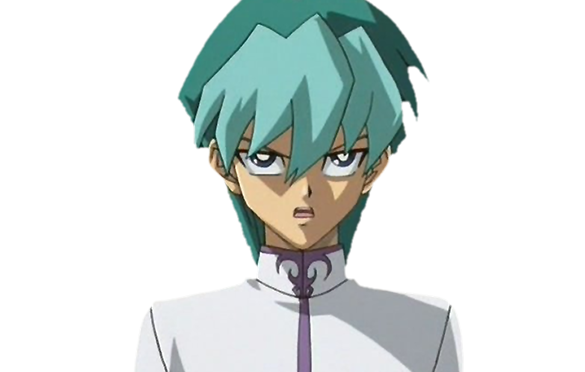 He kidnaps Seto and his passengers on Seto’s Battle Ship during the semi-finals of Battle City, hoping to take one of the passenger’s bodies, preferably Seto’s. With the help of the Big Five (the former chief executives of KaibaCorp who had been trapped in the virtual realm after their failed coup) and his father, Noah locks Seto and the others in his virtual world and Duels with them for their bodies. Unfortunately for the Big Five, they all fail to defeat the group; despite the amateur Dueling abilities of such players as Téa Gardner, Tristan Taylor, and Serenity Wheeler, the Big Five are only able to claim Tristan’s body- and even Tristan was only acquired on a technicality as Serenity actually won that duel with the aid of Duke Devlin after Tristan’s defeat-, with the combined Big Five being defeated by Yugi and Joey Wheeler in a final Duel. Disgusted at the Big Five’s failures, Noah deletes them (in the dub, he simply sealed them away forever) and decides to take on Seto himself, attempting to take Seto’s body so that he can fulfill his role as Kaiba Corporation’s heir. He brainwashed Mokuba Kaiba into regarding Noah as his true brother rather than Seto in order to weaken Seto’s resolve, before Noah personally Duels with Seto. Against Kaiba, Noah uses a 7 Turns of Creation Deck based around the symbolic creation of Earth, i.e. its developmental and evolutionary stages, such as floods, the reign of the dinosaurs, the ice age, modern and futuristic times, and the Apocalypse (represented through his Deck Master, “Shinato, King of a Higher Plane”). Against Yugi, Noah used a “Spirit monster” Deck, focused on replenishing Life Points at an extremely rapid rate.